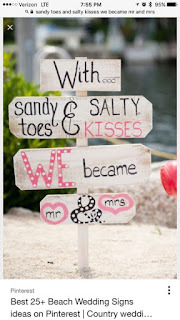 Our Bodacious Dog Mom Life: I Made A DIY Wedding Beach Sign. And, I Liked It. She added that she understood if I couldn't as it wasn't a doggy themed item. I immediately told her I would be more than happy to make it. I was honored that someone reached out to me with a custom order request for their wedding. Plus, I love it when people send me a photo of what they'd like followed by, "It doesn't have to be identical. Be creative. Use your choice of colors." We had a few things to take into consideration before purchasing the wood.The requested height was 3 feet. 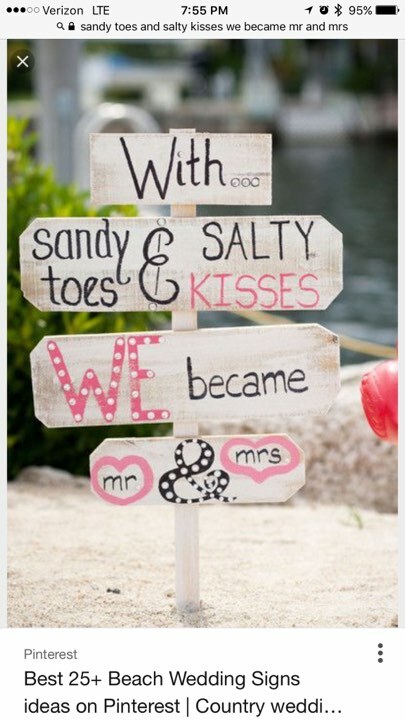 The bottom 12 inches would be in the sand for the wedding. Once the wedding was over, the newlyweds wanted to cut those 12 inches off and hang the remaining 2-foot piece on their wall to commemorate their wedding day. The pole had to be sturdy, but not too big. The 4 horizontal wood slabs couldn't be more than an inch thick. With 4 slabs of wood for the pole to support, and at the length and width needed, anything thicker would be too heavy. We figured everything out and Lisa stopped at Lowe's to buy the wood. A day or so later, she cut it down to size and angled the bottom of the pole so it would go into the sand easier. Now, the fun part. And I mean that literally. This is the photo I had to go by. There was only one request. No pink. Instead, use beachy colors. To replace the pink, I opted for a gorgeous Laguna Green. The other colors I used were antique white, black, and light brown. The finished product came out gorgeous! I decorated the block lettering and the border around the hearts. All of the colors blended together for a beachy theme. Once the paint was dried, I coated the entire piece with 2 coats of protective gloss. From start to finish was about 3 days. And, I had a lot of fun making this piece. Lisa delivered the wedding beach sign after work today. When she got home, I was at my desk in our home office. Lisa walked in and placed this bag in front of me. The message on the bag made me laugh out loud. Inside the gift bag was a bottle of one of my favorite locals wines. Taylor Brooke. I thanked Lisa. I could tell she was having fun playing the guessing game. "I don't know who else would buy this for me." "Yeah. She told me they already paid you, but wanted to get you a little something extra for making the sign for their wedding." Wow. I was shocked, but exceptionally grateful and touched by their token of appreciation. Seriously, it meant a lot to me. A lot of people have suggested I make non-doggy themed items. I've been considering it. It would definitely widen my audience. Not everyone has fur-kid pups. In the process of thinking about it, I've been psychoanalyzing the term "DIY Dog Mom Projects." Technically, that term describes a DIY project that a Dog Mom creates. It doesn't necessarily mean it's a doggy themed project. I might test the waters a bit, however, if I do, it won't be until after the first of the year. And, my focus will still, and always be doggy themed items.